I’m back from the 2nd annual Design & Construction Week (DCW) in Las Vegas, which is a total of 5 industry shows that take place at the same time! 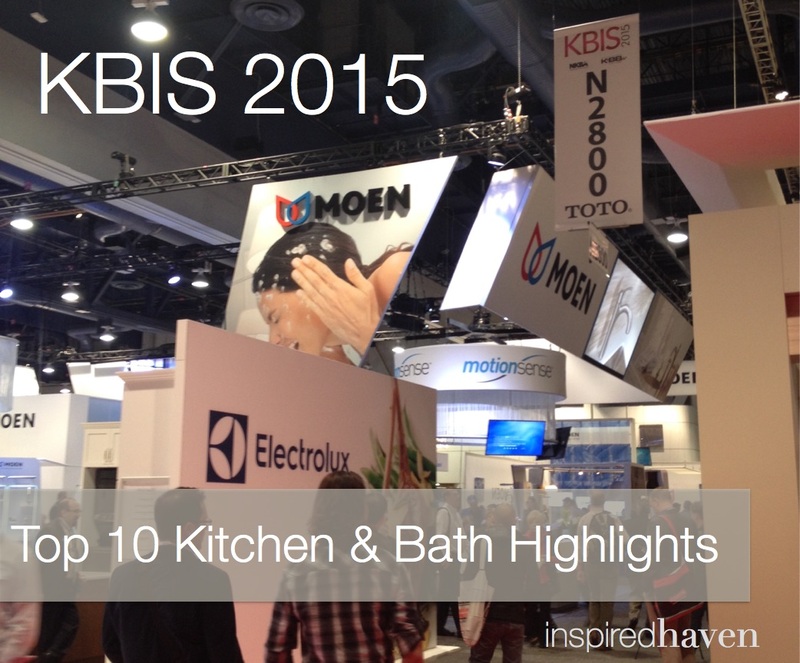 The Kitchen & Bath Industry Show (KBIS) is co-located with The International Builders Show (IBS), as well as the International Window Covering Expo (IWCE), The International Surfaces Event (TISE) and the Winter 2015 Las Vegas Market. What a packed schedule (and lots of walking), but definitely worth the aching feet because there was a TON to see. 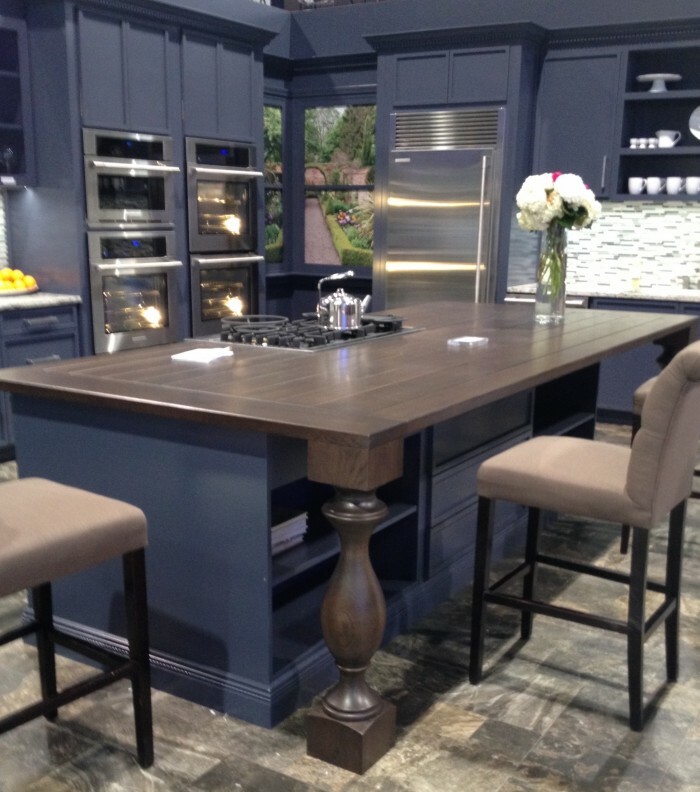 I want to share with you just a few of the highlights from KBIS, as a preview of what we can expect to see more of this year. 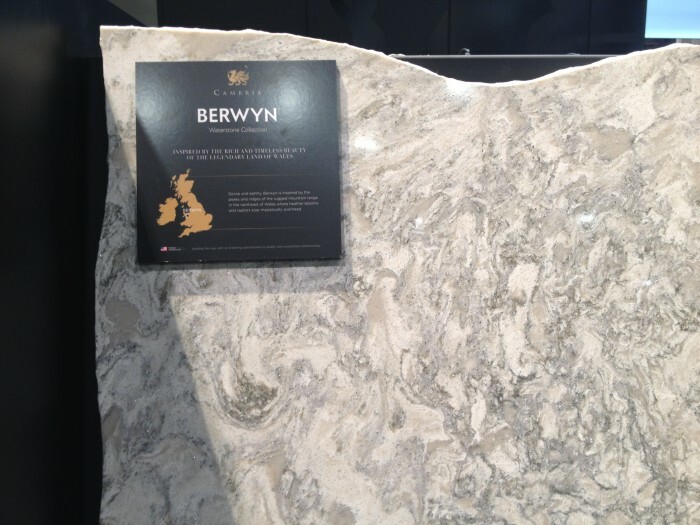 If you’re planning a kitchen or bath remodel in the near future, these are some trends you may be interested in. Gray and brown are still strong, and particularly together. This translates to rustic and muted wood tones for cabinets and floors, particularly with white or very light countertops. The most popular palettes are soft and neutral, but definitely not boring. 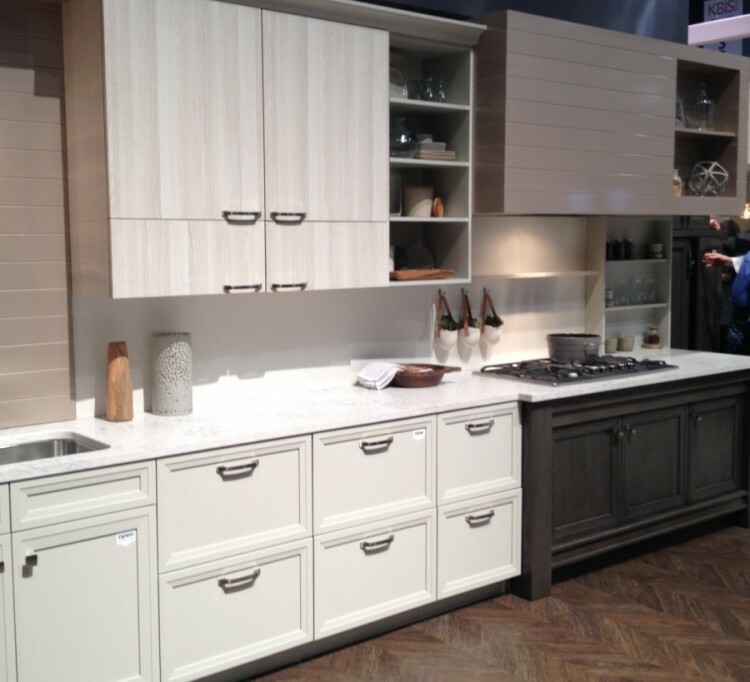 You may see 2, 3 or even 4 neutral cabinet finishes together in one space, particularly with a pop of white countertops. 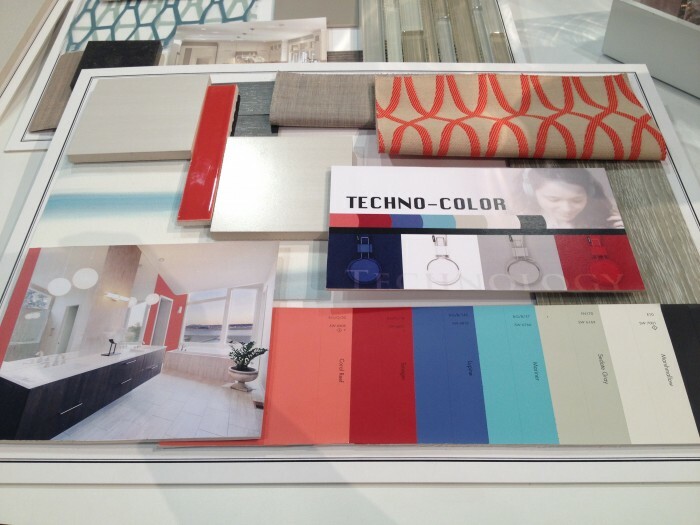 In addition to the muted gray tones, I noticed aqua and coral in varying intensities, as well as navy. Over the past couple of years we’ve seen a lot of jewel tones being used with cool grays, but the shift seems to be toward warmer grays and more optimistic, spring-like colors. 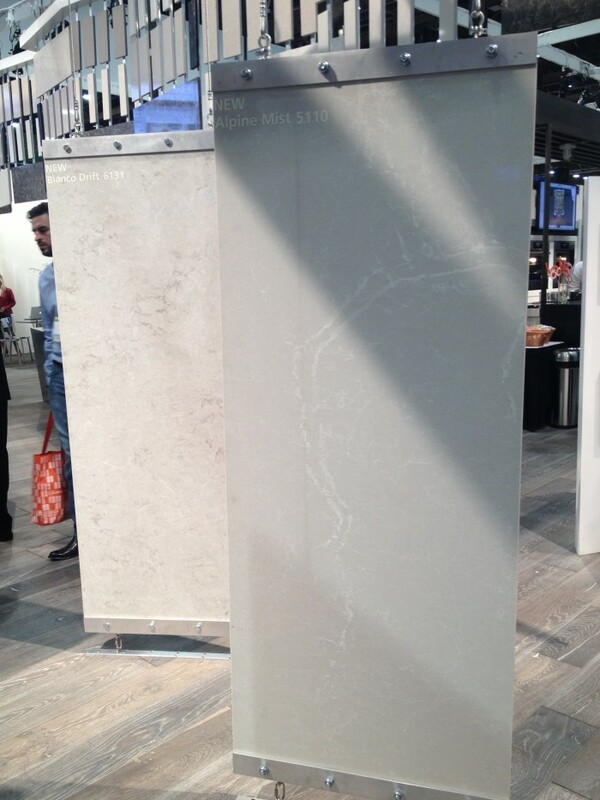 Quartz continues to gain popularity as not only a countertop surface of choice, but also as a full-wall backsplash or tub surround solution. Its durability and predictable grain make it a solution that fits the needs and aesthetic preferences of many homeowners. 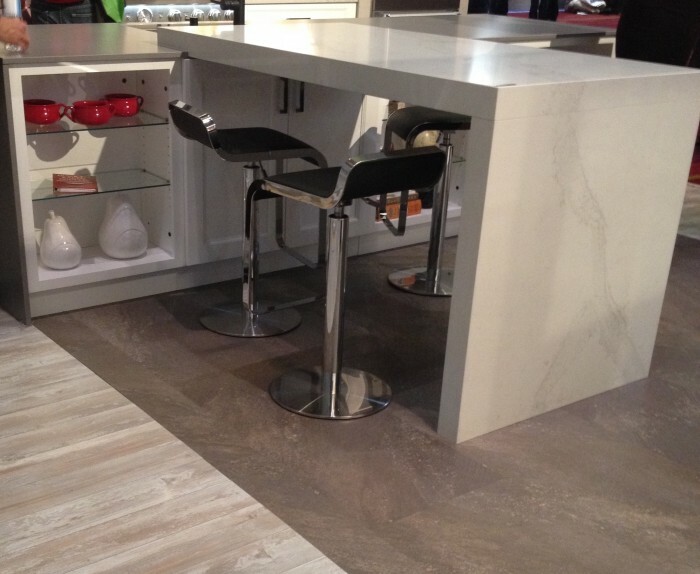 Quartz manufacturers are broadening the available selections with more and more options that mimic natural stone patterns, and with many of the grays and pale creams that homeowners and designers are asking for. 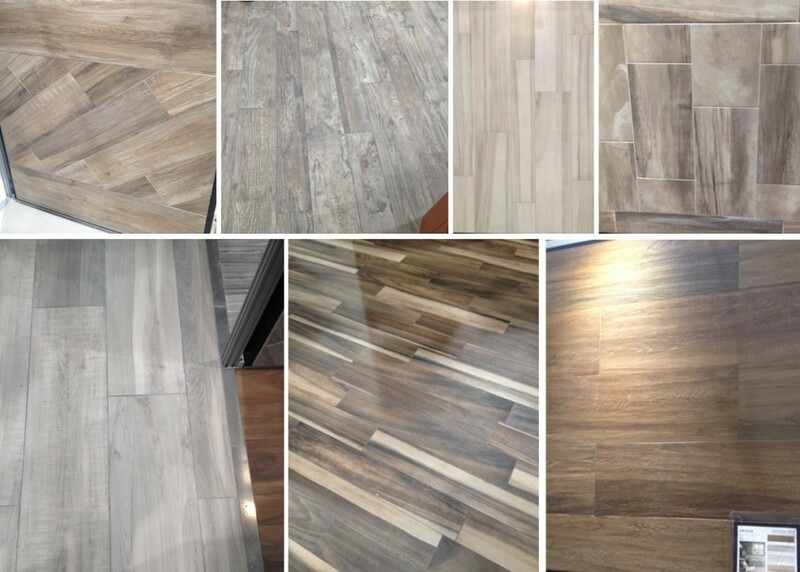 The biggest tile trend by far is faux bois – and the tile makers have done a great job of offering a larger variety of color and styles for 2015. 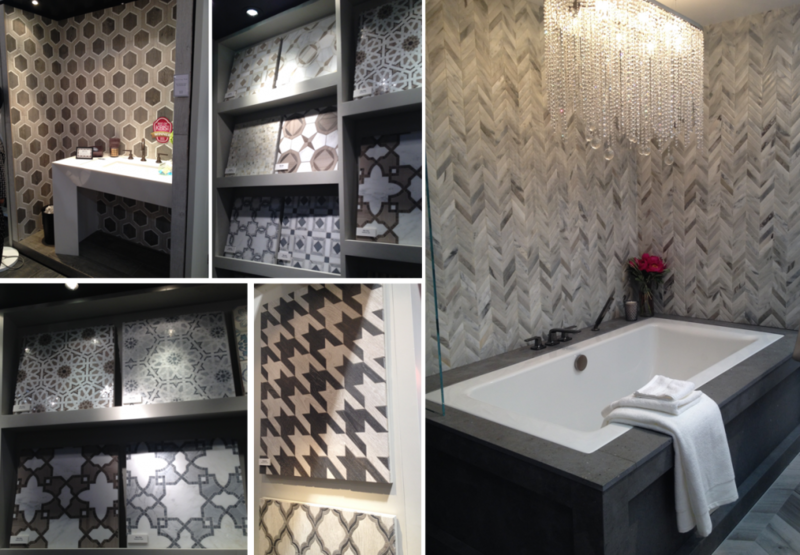 I also noticed tile backsplashes are getting bolder. We’ve seen a lot of white subway tile over the past few years, along with some herringbone and moroccan patterns more recently, but now bigger, bolder patterns are showing up… like circles, sunbursts, houndstooth and the like. They work well with the laid-back neutral palette of soft gray, brown and white because they function like wallpaper as an accent over a white quartz counter to provide drama and interest. Patterned tile is a commitment, though, and although it’s hot today, the trend may fizzle out before you’re ready to change it out. My recommendation is to pass on it for a “safer” alternative unless you absolutely love it and can decorate around it. 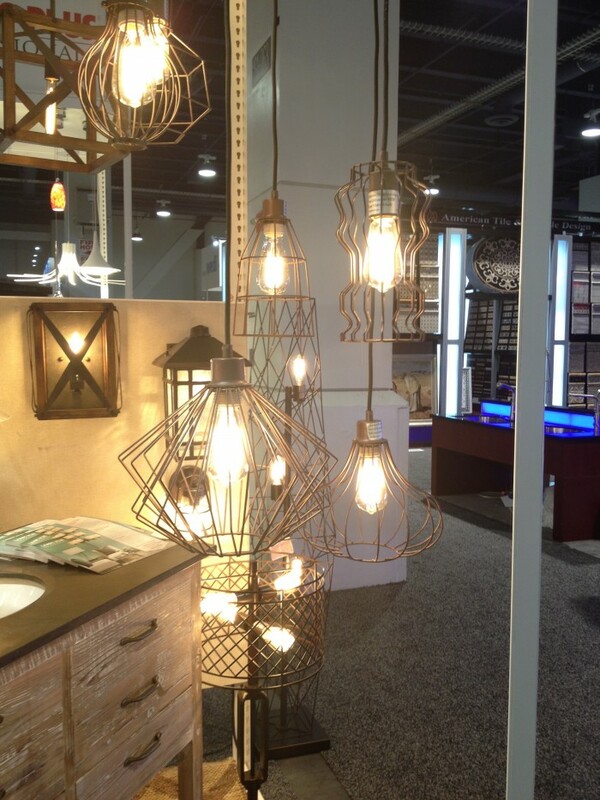 Lighting is HUGE at this year’s show – and it’s everywhere. Above and below cabinets, inside of cabinets, built into mirrors, inside the medicine cabinet, even inside cabinet drawers. 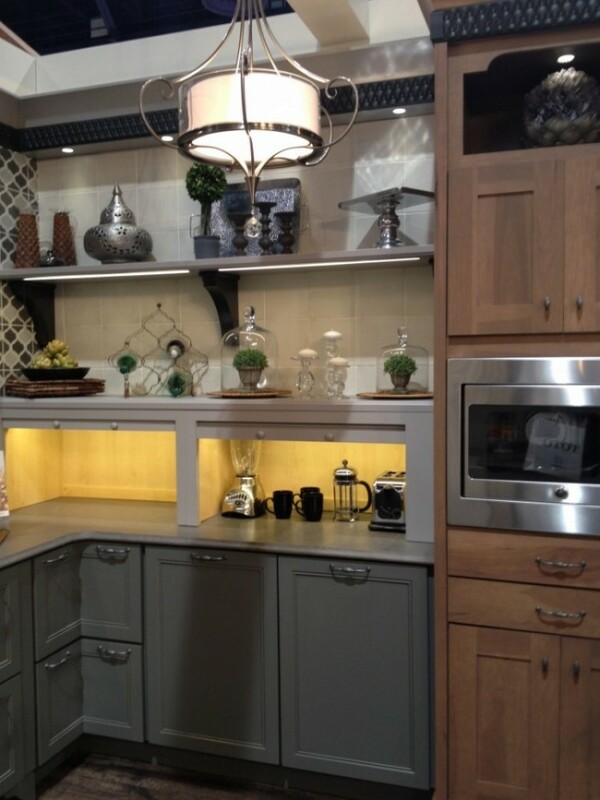 And, it’s not just for the new kitchen — the addition of lighting is a pretty simple way to update existing cabinets too. 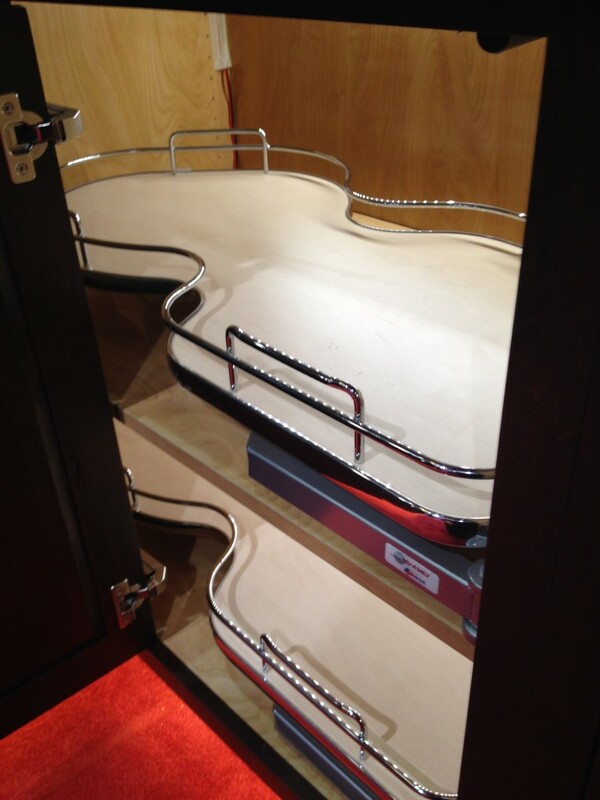 Lighting inside the cabinet illuminates what’s inside the drawer and adds a touch of luxury. 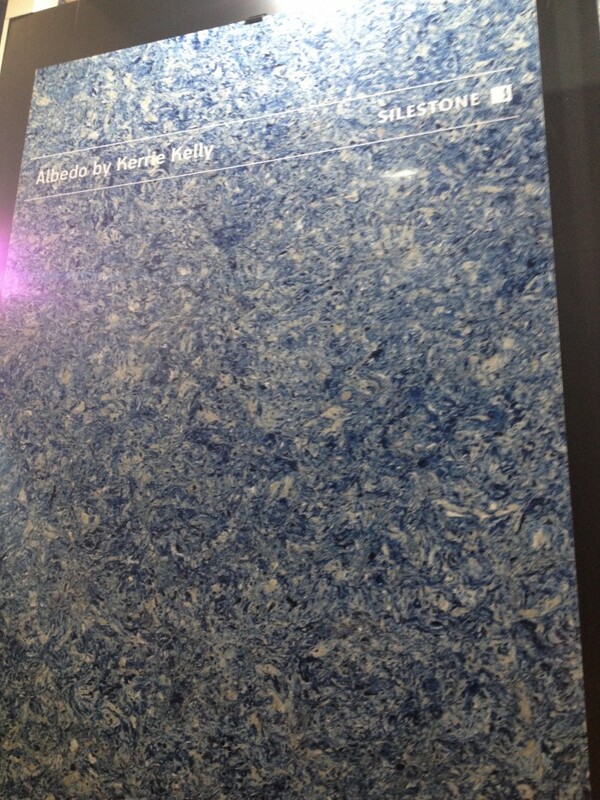 Display by Hafele. 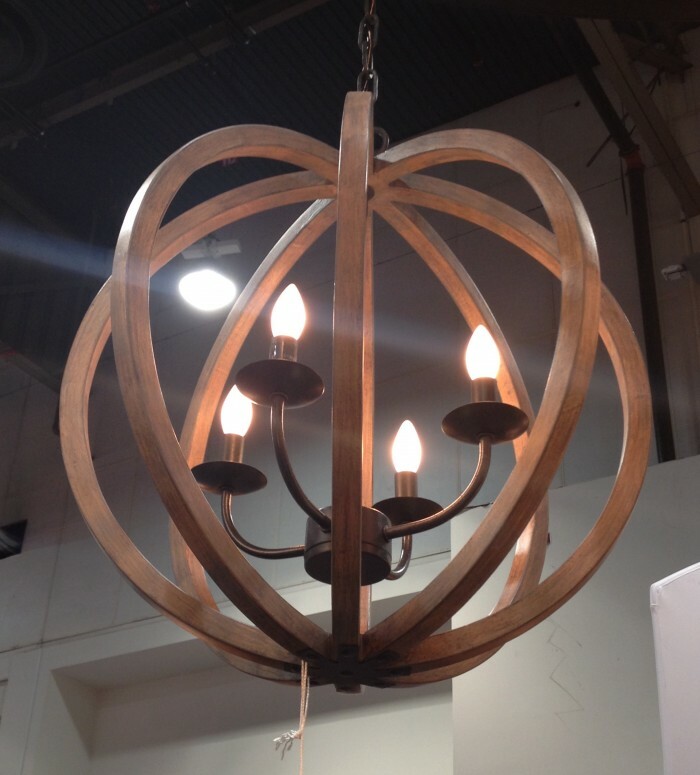 As far as light fixtures go, orbs are still very popular, as well as cages and drums. 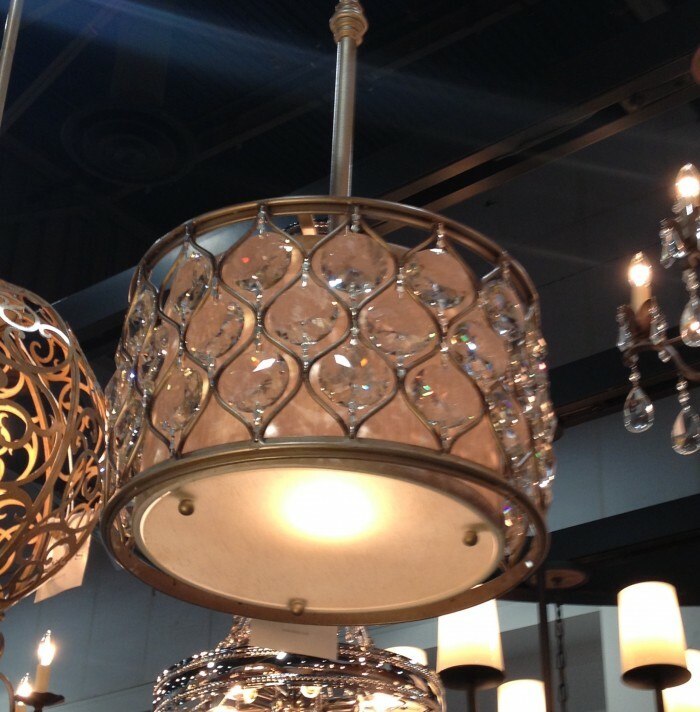 Sparkly drum light, IBS 2015. Sea Gull lighting. 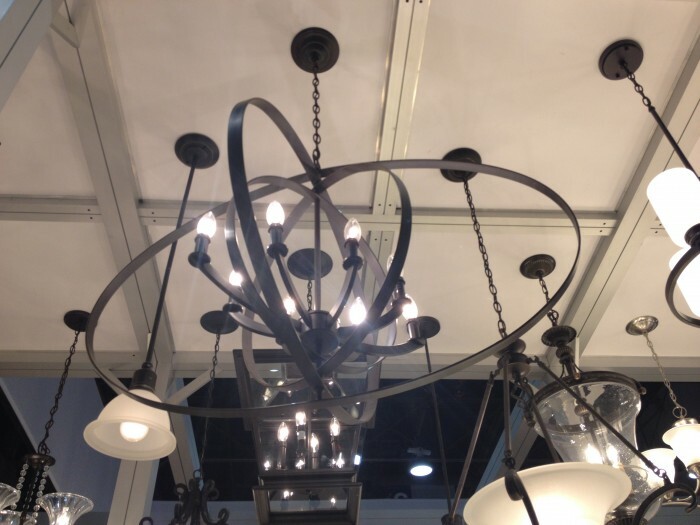 Orb lights are still popular, IBS 2015. Sea Gull Lighting. 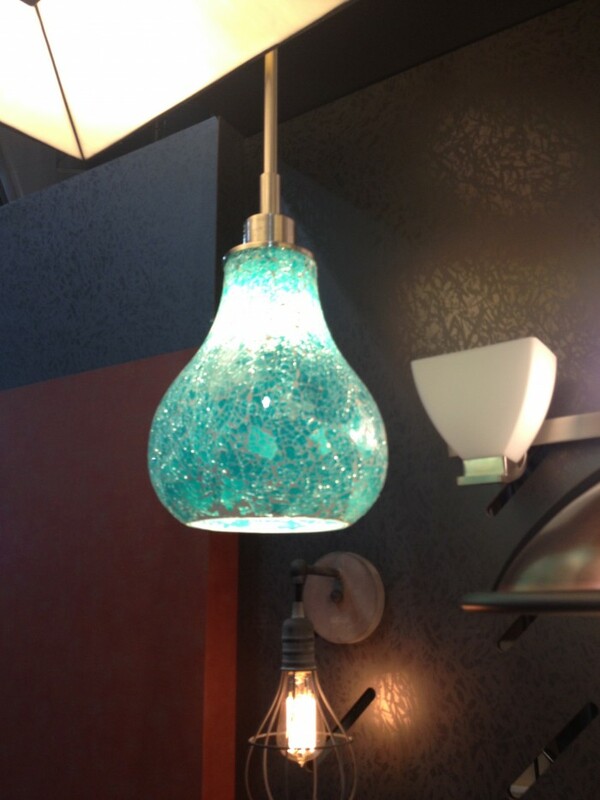 I saw quite a few whimsical, fun fixtures too. And the Edison bulb is gaining popularity. 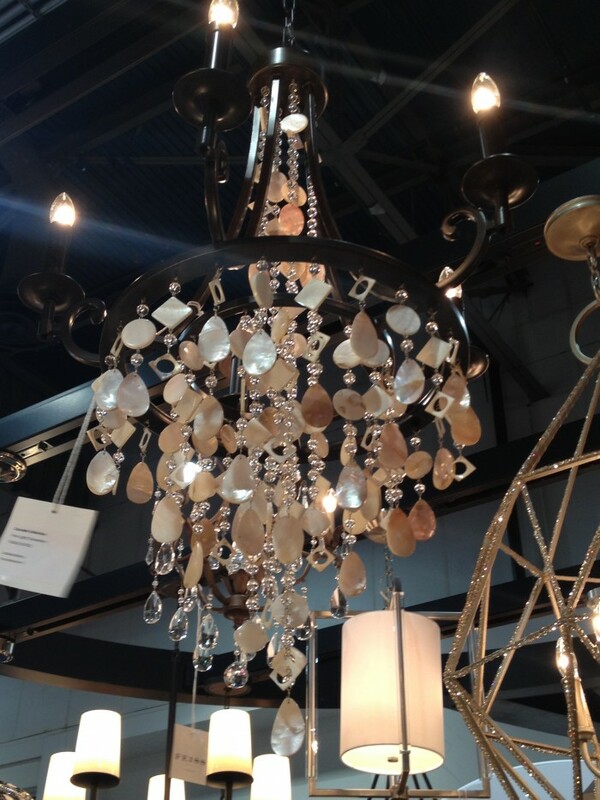 Almost every display in this year’s show featured a wonderful mix of textures. Smooth countertops were paired with a combination of glossy and rustic cabinet finishes, along with wood textured floors; tiled, bricked or wood backsplashes complemented industrial touches like metal tambours (roll-up doors) and shelves, and blingy light fixtures topped it all off. Metals were a mixture of polished and rustic too. The prevailing theme seemed to be industrial chic. It’s rustic-meets-urban-meets-glam, all wrapped up into a functional and fabulous space. 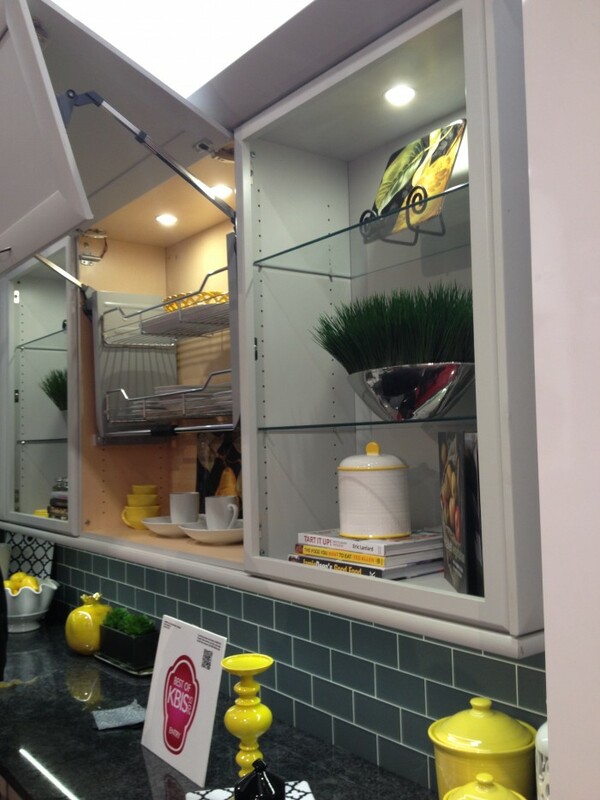 A kitchen update isn’t complete without considering storage solutions. 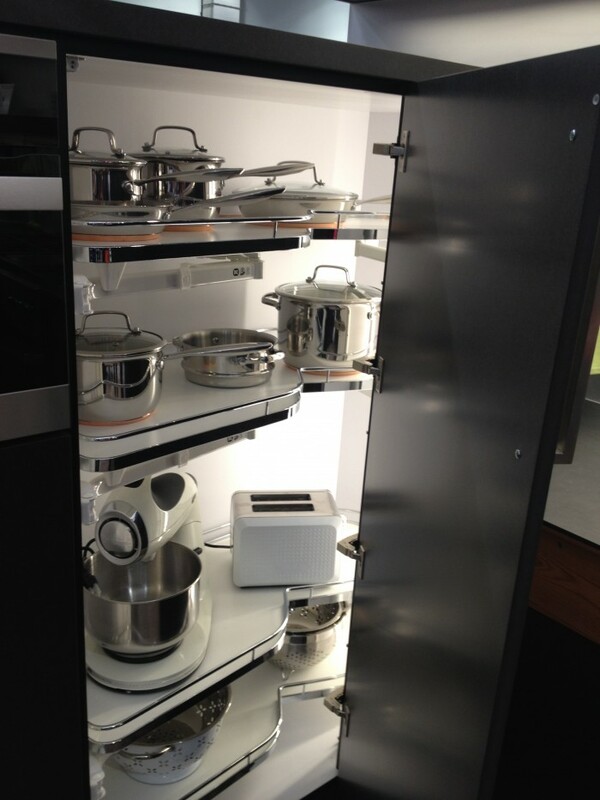 Corner cabinet storage solutions such as the Le Mans pull-out are still hot, including units for taller cabinets. 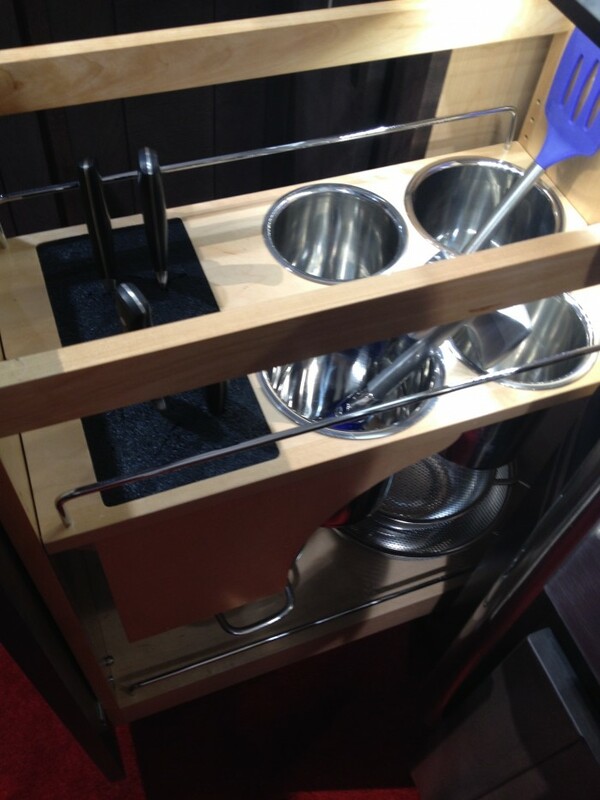 Utensil and knife storage pull-out organizers were big in a lot of the displays too. 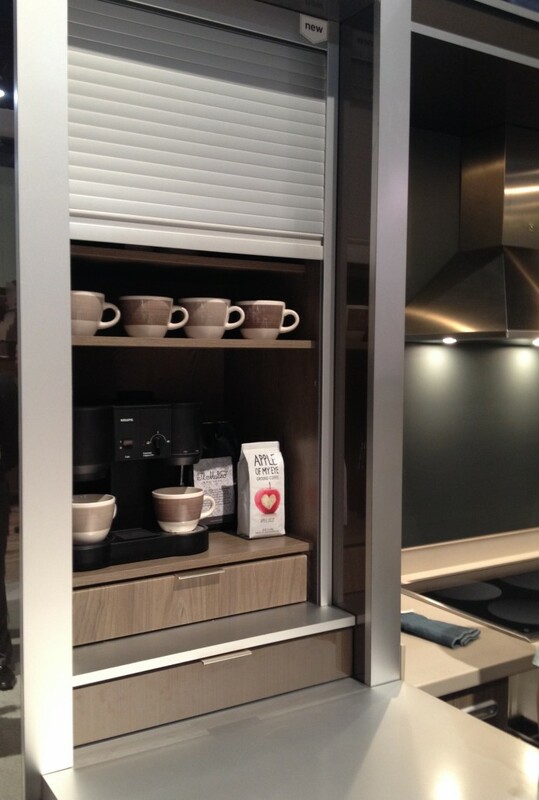 The two most popular convenience items shown at this year’s show were the sliding cabinet door and the lift-up bifold door, both available with servo technology so you can just touch the door to slide it or lift it up. 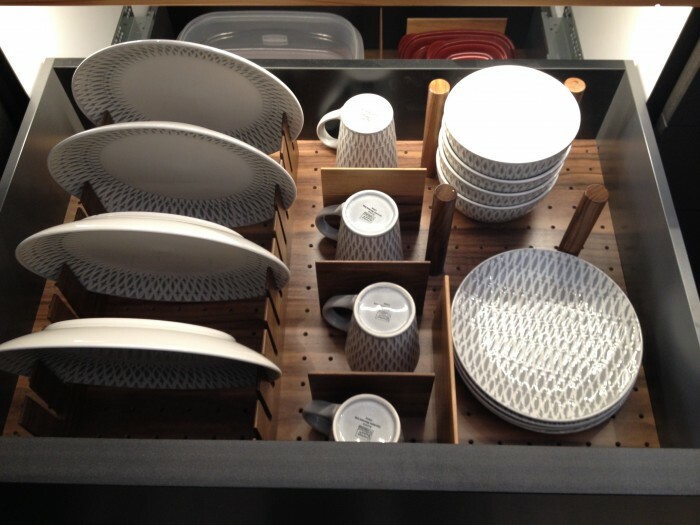 The same technology can be used with drawers so they can be pushed to open with no hardware for a minimalist look. It’s on the spendy side as far as cabinet conveniences go, but if the budget allows they are a great feature to include. 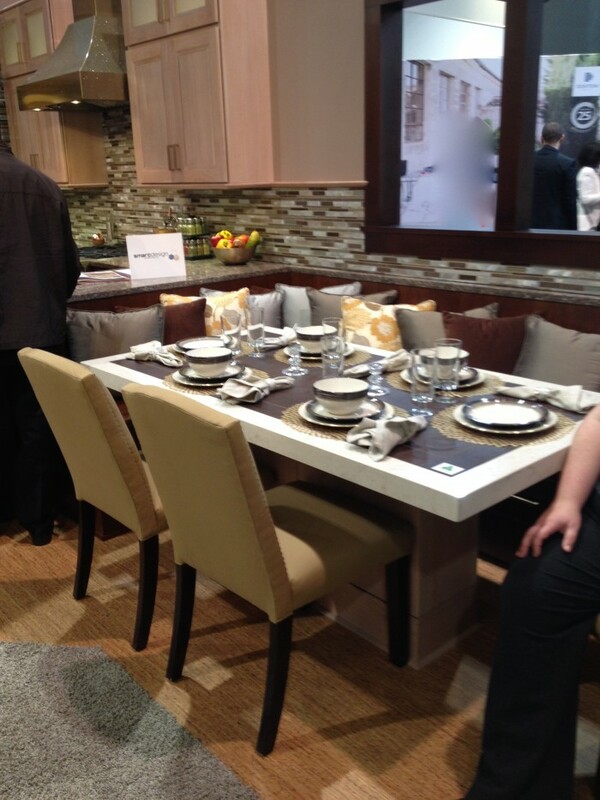 Multi-level islands were popular in most of the displays, and most featured built-in seating areas. 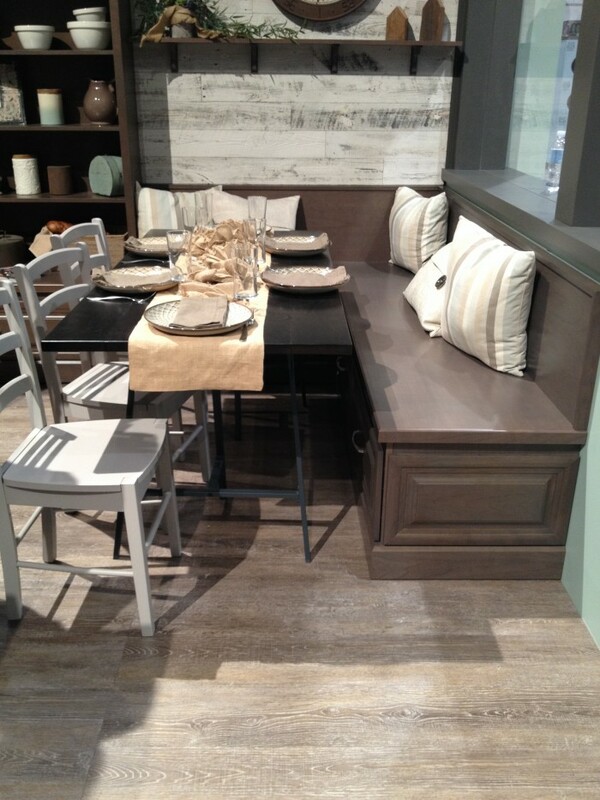 Banquettes bring family meals into the kitchen with an informal seating area. Single-level island tops with overhangs allow for gatherings around the kitchen island, like a kitchen table but with the added function of having kitchen storage and counter space built in. Nearly every major appliance manufacturer had their induction cooktop at front and center. An induction top stays cool to the touch and only provides heat to compatible pots and pans. It heats the contents quickly and evenly, and provides precise control over the heat used in the cooking process. 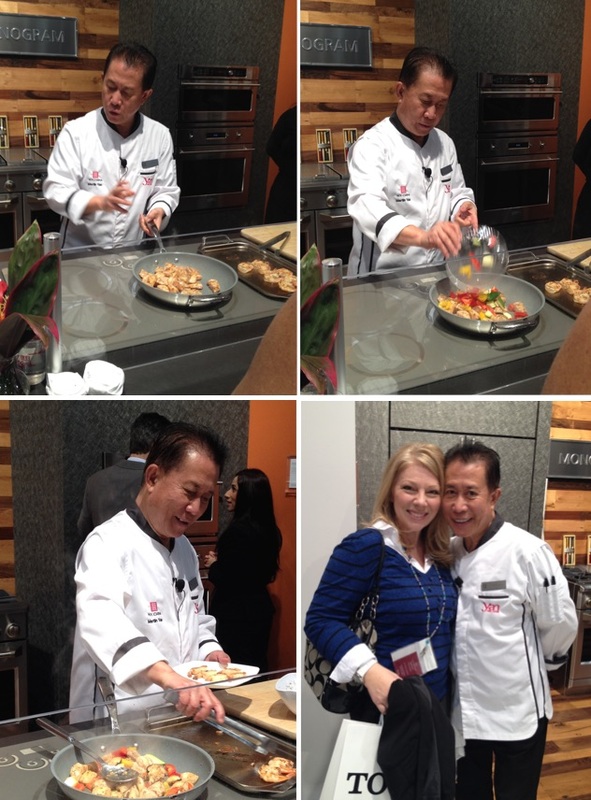 Induction tops were demonstrated by several celebrity chefs who were on hand for the event, including Martin Yan, who was kind enough to pose for a photo with me! 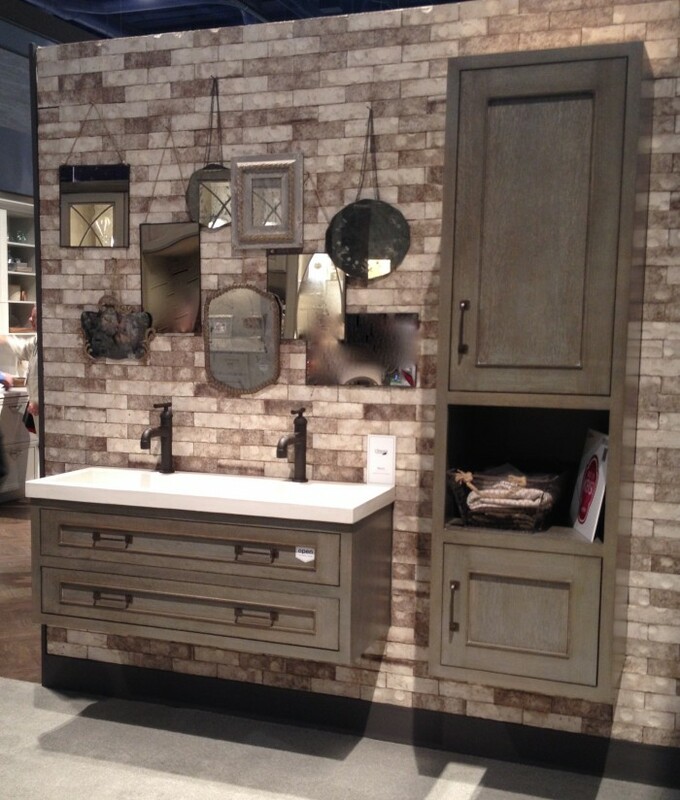 Nearly every cabinet maker also showed a floating/ wall hung vanity paired with a wall-hung linen. This style is not reserved for ultra-contemporary styles; it works equally well with urban, rustic and transitional spaces and everything off the floor for ease of cleaning. If you’re considering a floating vanity, make sure to let your contractor know, since the plumbing needs to be located higher than usual to clear the open space below the vanity. Wall-hung vanities also require additional support inside the wall to accommodate the weight of the cabinet, the countertop and the strain of everyday use. 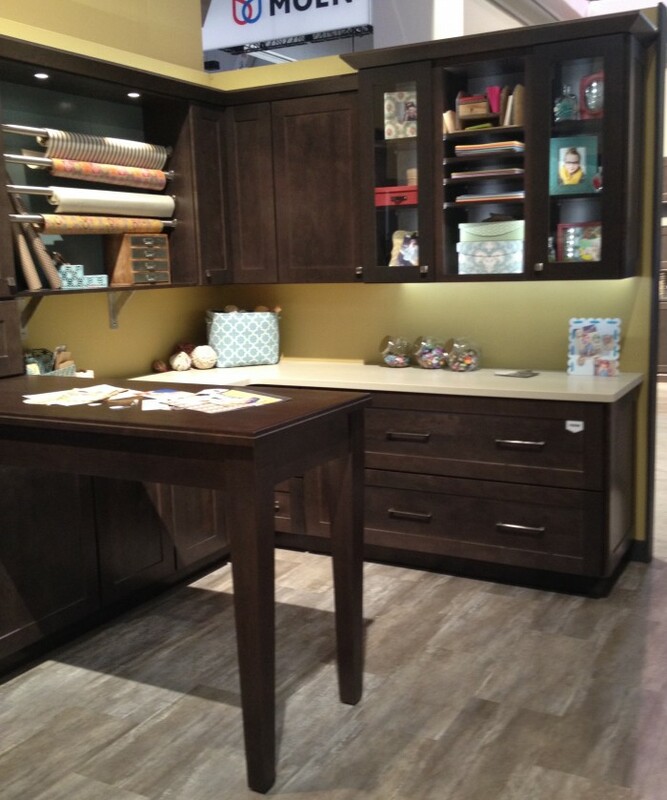 Craft rooms are finally getting the attention they deserve from cabinet makers, with several of them showcasing dedicated, organized craft areas. 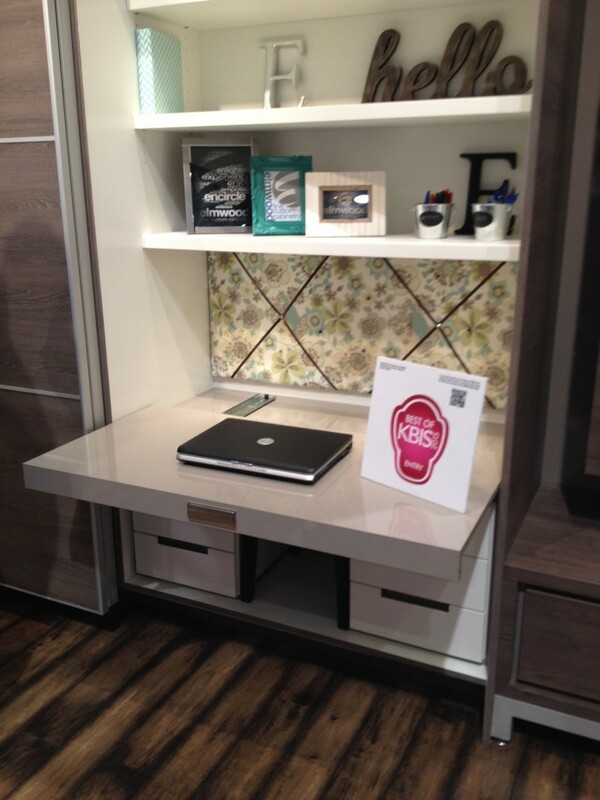 Features include: gift wrap station, bar-height work surface that works well from a seated or standing position, and kitchen height storage rather than traditional desk height cabinets. This one from Elmwood Cabinets actually hides behind a sliding door so it can be part of a living space but can hide behind closed doors when not in use. So…. that’s it for my 2015 recap. What are your favorites? 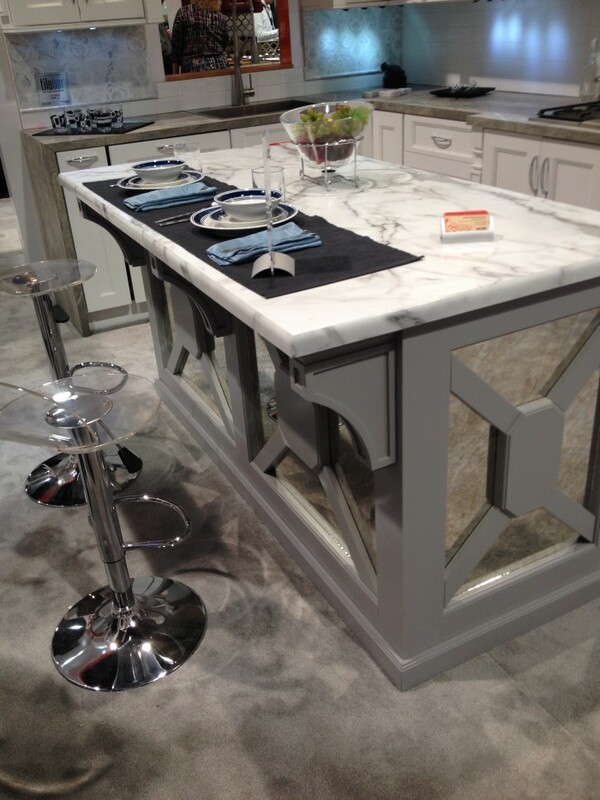 What features would you like to incorporate in your kitchen or bath (that you did or didn’t see on the list above)? 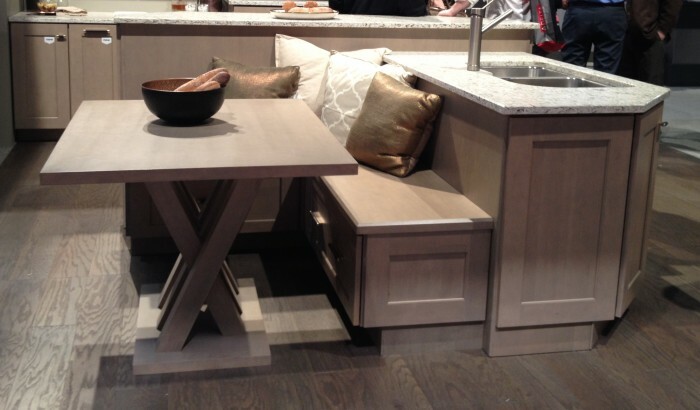 I love the second banquette pictured above with the tall open storage. They work together to make the kitchen feel warm yet tidy. The knife and utensil storage is a nice solution for clearing the counter and keeping the knives out of reach of little hands.